Consultants who attend RPCN events are usually asked to provide the other participants with their “30 second elevator speech.” As facilitator of the Technical Forum, I have found that the “30 second” speeches take from 10 seconds to 2 minutes, depending on the person. Some people just offer who they are and what they do. period. Others, intentionally or not, often go on and on (blah, blah, blah?) about their businesses, etc., and finish long after the rest of the group has become bored and stops listening. 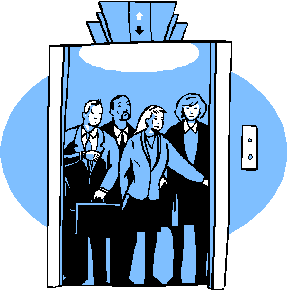 Several years ago, a member of RPCN presented the results of an actual scientific study of the effectiveness of “elevator” speeches. I found the results astounding and would like to share them with other consultants. The results of this study are below. Note that they provide information on 15 second speeches instead of the usual 30 second speech. This is because the study showed that you actually have only 15 seconds for your elevator speech before the listener begins to lose interest. Understanding this can be of great benefit to a consultant. It says that the real purpose of an elevator speech is to say almost nothing about your own business, but rather to ask questions about the other person’s business in order to find out if they have any problems that you can help solve. The message here: prospects don’t want to hear about your business nearly as much as they want to talk about their own business. 15 seconds -- that’s all you have and that’s all you should use for your elevator speech. This is science talking, not just me. Do the Elevator Speech Math! A normal speaking rate is about 125 words per minute. You have 15 seconds for your “elevator” speech. 31 words for your ENTIRE elevator speech! to describe what you do and ask about their business. Hi, I'm Lawrence R. Berger. I'm a new RPCN member and I've also got well over 30 years of experience in sales and marketing. Part of RPCN's mission, as I understand it, is for members to share their knowledge and, expertise with each other. Big Ticket Closers and Small Ticket Closers. Let's take them one by one. Big Ticket Closers: Sales people of this type usually deal with products valued at $10,000 or more each. Examples include: real estate, commodities, energy production etc. These sales reps are used to talking to people with major money avalible to spend on such items and usually can be found wearing suits and ties. Many can go 8 months two up to five years to get a deal but since they operate on the "single unit" theory to make their money ( example: it may take a year for me to close a deal but If I can just Sell ONE, I'm set!) . Small ticket Closers: Sales people of this type usually deal with products priced under $500.00. Examples include: books, food, retail sales, and most products sold on the web. Sales people who use small ticket or mass market theory work just as hard as Big Ticket Closers, but it often takes less time for them to close a deal (example: walk in to a Barnes & Noble and ask a sales person how to find a book; they walk you over and look it up on the shelf, take it down and hand it to you. that book's seller has just "closed" a sale and on average they do that 50-1,000 times a day!). Their individual pay checks may be smaller than what a Big Ticket Closer makes, but if you average over a year and look at their tax returns, you'll find they just might match up. As a consultant you need to decide which theory of salesmanship you want to operate under. There are many books written by big ticket closers but usually they have help from writers who by nature operate on mass market theory. A small ticket closer may want to ask for a $50,000 investment from a bank but will usually consult a big ticket closer first. I've worked under both theories in my day. For me small ticket is better, but that's me. You have to decide for yourself, too. I hope this helps! If one thing doesn't work, try something else. You need to use various methods even in the same game. It's okay to "cheat" - in other words, ask for help. Or in the case of the game, try a number to see if it works. When all else fails, go back to the beginning. If you get stuck, put it on "pause" and take a break. Go do something else. Set a limit on how much you will "play." Don't get distracted and spend all your time playing the game; you have other things to do in your business besides marketing. Check your progress as you go along. You can do this by clicking on "Hint." For marketing, how many follow-up calls did you make or how many e-mails did you send? Get organized, and the pieces will fall into place...How are you doing? Check your stats periodically. 14 calls made; 4 proposals to do! And finally, remember to have fun doing it! A common strategy used by businesses to attract clients and customers is to join groups such as chambers of commerce, trade associations, and professional organizations. Yet I have met many people who have been substantially disappointed with the results they have gained from belonging to such groups. Getting clients from a business group is very different from attracting clients via other kinds of marketing efforts. Certainly any financial commitments you make in terms of advertisements in group publications or event sponsorships gains you the organization’s gratitude and some publicity. But that isn’t enough. The biggest difference is that personal involvement is required to gain the reputation that attracts business. As you have probably heard and experienced for yourself, people do business with people they know, they like, and they trust. The kicker is it takes time for that to happen, lots of time, as well as active involvement. Often people leave a group just as they begin to become known and liked, unaware that they are leaving just as it might appear their efforts may start to pay off. This may sound basic, but you must choose a group in which members of your target audience are active participants, not just listed on the member list. Check out the group’s web site, attend a couple of meetings as a guest, and talk to other members to get a sense of who is active and whether they are a match for your business. Are you passionate about the group’s mission? If not, it will be difficult to build and maintain momentum for a long enough period of time with the group to attract potential clients. I am not advocating that you walk in and start selling. Instead, initially focus on simply getting acquainted with a few people and gaining a sense of the people who are attracted to the organization. Call a member of the organization’s board (or the staff, if there are any) and ask to meet for coffee to talk about the group. Find out how the group operates, who runs the committees, and who gets things done. Decide on what you want out of involvement in addition to the relationships that may bring you business. Do you want a way to contribute via the skills and knowledge you already have? Do you want to learn something new? Decide on the answers before joining and approaching anyone about volunteering. There are lots of other resources that will tell you how to work a room and network at all types of events and activities, so feel free to Google those phrases for those ideas. My favorite way is to act as a host for the organization when at an event, even if I’m not involved in running it. I watch for people standing alone and walk over to introduce myself. When in conversation with someone, I’ll ask if they had any particular goal in attending such as someone they wanted to meet. If so, I’ll try to find a way to bring them together. Trite as this advice is, it’s required to build the reputation necessary for others to know they can rely on you. For example, I rarely recommend someone’s services based solely on their reputation. My own reputation rides on the performance of those whom I recommend. Therefore I prefer to have had some level of contact that tells me about them, builds their trustworthiness in my eyes, and familiarizes me with their business. Whatever your skills or interests, there is at least one group and probably several who would welcome your involvement and commitment with open arms. Volunteer groups always need a steady stream of incoming talent to replace those who have moved on to other interests. The key is not quantity of time spent with the group but quality. Even if you only have one hour a month to contribute, yet you do it without fail, and your output or results contributes to the organization, you will be valued. Getting on the organization’s program schedule in that first year or as soon as possible, and giving an informative, high-value presentation, not a sales pitch. Of course, when it comes to doing business, it works both ways. When looking to purchase products or services, do you give first consideration to others you trust in the group? Consider referring the relevant members of your group to friends or associates who need their products or services. In Influence: The Psychology of Persuasion, author Robert Cialdini discusses the rule for reciprocation: When you give something to someone else, it causes a sense of indebtedness in the recipient. Dr. Ivan Misner built a multi-million-dollar company, BNI, completely based on this rule. Additional activities that can help raise awareness about your company include underwriting events or other needs within the group such as covering the cost of newsletter or web site development. Hosting an event at your company (including refreshments) can be a great way to support the group and familiarize people with what your company does. Demonstrate a commitment to the organization and its members, and give other members a variety of ways to get to know you. The rewards will be more than you imagine. According to a Rain Today survey of over 200 businesses that hire service providers, "referrals from trusted sources" were the most important factor in a hiring decision. Ironically, handling referrals correctly is an often overlooked portion of business etiquette. Always Remember This: A referral is a vote of confidence. You have impressed someone (e.g., a friend, colleague, client) enough with your services to the point where they feel compelled to recommend you to someone else. They are giving up their time to pass your name along in order to help you. This is an act of kindness and should always be thanked. Furthermore, the way you handle the referral will reflect on their reputation and yours. Thank the person calling with the referral and ask, "How would you like to be involved in this process?" Maintain open communications throughout the process. Operate in the moment. This may sound a bit Zen-like but it simply means don't wait too long to follow through with your actions. A Referral Scenario: Act I: Your phone rings and it's a familiar client. Client: Hi, this is Jane from XYZ Company, how are you? You: I'm great and you? Client: Doing well. I have a referral for you. You've been a tremendous help so I was telling a colleague about you and she wanted me to give you her contact information. You: Thank you. I enjoyed working with your company and the highest compliment any client can give is a referral. I've also been passing your name around in the community. (Obviously, only say this if it's true.) What's her contact information? Client: It's Jim Great at 123 Main St., 123-4567. Here's his e- mail and you should know he's in the medical industry. You: Thank you. How did you leave it with Jim on how I would contact him? Client: I said you'd call or e- mail. You: Perfect! I'll call him right now. Let me ask you, how would you like to be involved in this process? Client: Just send me an e-mail and let me know how it works out. You: You got it! Anything else I should know? Client: Yes. He has 3 school age kids and he's hard to reach after 3 p.m.
You: Thanks again, I'll act on it (insert when you know you'll follow through). A Referral Scenario: Act II: Hang up and call or e-mail Jim. You: Hello, Jim Great? This is (your name) from (your business) and I was referred from Jane to speak with you about (your services). Jim: Yes, I spoke with Jane and your name came up. You: Yes, Jane is an excellent client and we had a great relationship. I'd like to know what you need help with, but first, let me ask you, "Do you have a few free minutes to talk?" Jim: Well, we are having problems with (listen carefully)! You: Would you like to set up a time to discuss your needs in more detail? I find it best to meet you at your location and learn about your business. How is next Tuesday at 2:00 p.m.? Jim: Great. See you then. Send Jim an e-mail confirming the face-to-face or phone meeting. Immediately call Jane back and update her. Thank her again, and ask her one more time how she'd like to be involved. Send Jane a thank you card. If it's a big client, consider including a small gift certificate for coffee or to a restaurant. Follow this basic format for all your referrals and feel confident that your business and referral etiquette is as good as…gold? No. It's as good as your improved bottom line and reputation which is even better. Mike Krause is the Chief Sales Architect and owner of Sales Sense Solutions where he helps business owners stay four steps ahead of the competition with stellar sales and high performance sales assessments, strategies and practical advice.